Strategies for Social Change (SSC) is committed to developing a diverse set of tools that help build healthy, sustainable and impactful organizations. We encourage you to download any of the resources below and visit our website often as we expand our collection of free articles and helpful tools. 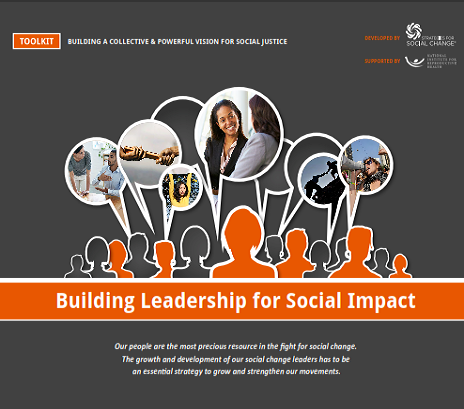 Developed by Strategies for Social Change (SSC) and funded by the National Institute for Reproductive Health (NIRH), this toolkit is filled with tools and strategies to help social change leaders become more intentional about developing a reflective leadership practice. The toolkit explores the importance of building a strong leadership bench and learning culture within social change organizations. 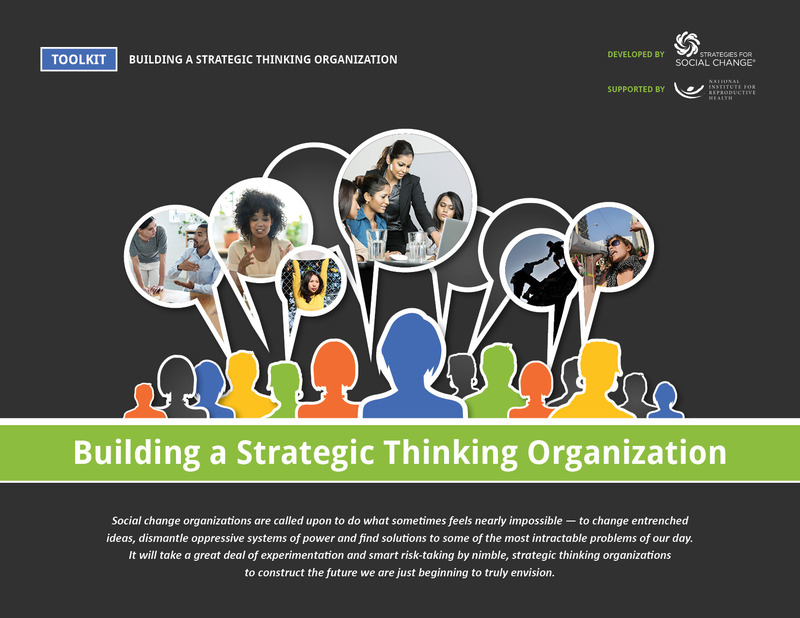 Developed by Strategies for Social Change (SSC) and funded by the National Institute for Reproductive Health (NIRH), this toolkit introduces practical techniques for improving strategic thinking within organizations. The reader is introduced to tools for improving context mapping, trends analysis, scenario thinking and decision-making. It also provides a framework for understanding the typical stages of any change management initiative. 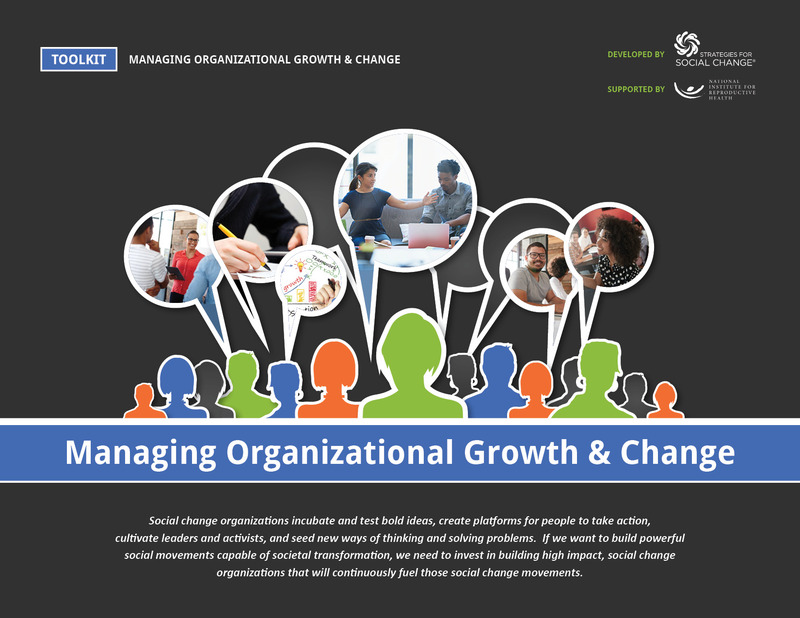 Developed by Strategies for Social Change (SSC) and funded by the National Institute for Reproductive Health (NIRH), this toolkit explores the eight essential characteristics of highly effective organizations as well as strategies for scaling up your organization and successfully managing major change initiatives. The toolkit introduces you to key change management exercises such as force field analysis and offers a step by step guide to help you design and implement major change initiatives. “The resources that Strategies for Social Change offers are fantastic—they offer concrete recommendations that have allowed us to better breakdown concepts like "strategic thinking" for team members who are growing and learning in that area of their work. Their resources take complex topics and make them accessible and actionable."